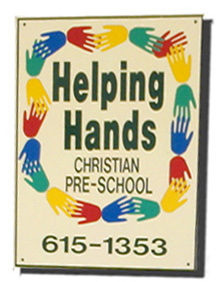 Helping Hands Christian Pre-School opened our doors to all children in September, 2001. We incorporated as a non-profit school and received our charter from the New York State Department of Education, July 2003. As a mission of the Goshen United Methodist Church, we have a board of directors comprised of church members. They include Susan Armistead, Paul Bunning, Denise Hawkins, Carol Keesler, Linda Babula, Pat Schwetje, Stephanie Gomes and Pastor Susan Chupungco. Admission is open to children of all religions, races, and national and ethnic origins. Our school is Christian oriented but not denominationally oriented. We will promote the elements of faith that are common to Christian people. All chilren must be immunized. Our staff are experienced, loving instructors who are committed to Christ. While our staff members may have varied educational backgrounds, they all bring unique gifts and talents to share with the children. The staff is certified in CPR and have undergone background checks.